Ever since my childhood I was a huge fan of the Zelda series of games, Golden Axe Warrior, Secret of Mana and games in which let you explore a vivid world without time pressures and a too restrictive storyline. Over the past year and a half I've been working on my vision of a modern exploration adventure, combining it with my fondness for modern crafting and sandbox games. 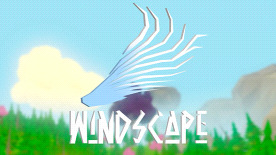 In Windscape you play as a young girl living on your parents' farm, set in a lovely world made up of floating islands in the sky. As you discover the world you learn that something has gone terribly wrong - islands are breaking apart and falling from the sky! It's up to you to discover the evil that is threatening the universe of Windscape. I have created a resource and crafting system which is intuitive to use but allows many things to be made. Basically you will find different crafting stations at key places all over the islands, each enabling you to build different things if you have gathered the resources needed. You can cook healthy or just yummy food, craft sweeping shields and weapons, mix mysterious ingredients to create powerful magic potions, melt iron and copper into new forms of metal and much, much more. I want the dungeons to be an enthralling deviation of the more open exploration and story driven game that takes place on the islands surface. The first big dungeon you will encounter is a copper mine infested with rat-like enemies. Here you will also encounter the first bigger boss monster - with a great reward waiting for you if you make it out alive. Some dungeons will be an incremental part of the story while many others and smaller caves are hidden in the world for you to just discover. I hope you like my ideas of Windscape. Together we can all create a game which lives up to the vision I have set forth. Thank you for your support!